There is a reason why some of us are highly sensitive. If you have dealt with a lot of heart ache and difficult times, you are most likely one of the Change Makers. We came here specifically to plant seeds for a new way of being. It is not an easy job to bring about change as there are many on the planet who resist change. If you feel like you don’t fit in….then guess what, you are one of us. Many people are feeling called from within to make changes in their lives right now….to discover more meaning in life. We are moving from the era of the mind into the era of the heart. I call us “The Bringers of the Heart.” When you learn to trust and follow your heart, your purpose calls you forward. I want you to know that you are needed. I need you…your people need you and the world needs you to contribute what only you can contribute. There were many times I wanted to exit this planet because I felt too confined and limited. I learned to look within for answers and I have been guided to discover some very incredible things. I love my uniqueness and what I have been able to create. I am like a detective discovering my life as I live each day. I invite you to discover yourself and share the innate gifts within you! And if you are already doing this…know that you are the inspiration for others to follow their path. 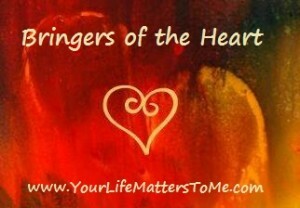 You are one of the Bringers of the Heart!